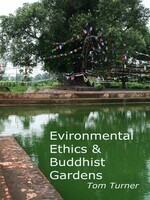 Buddhism is the world religion with the strongest connection to gardens. It originated in the foothills of the Himalayas (c600 BC): see entries on Kapilavastu and Lumbini. It is therefore understandable that mountains came to be associated with gods. Deities have a place in Buddhism but there is no creator god. 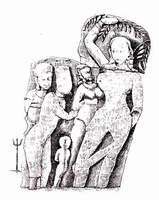 Mount Sumeru (Mount Meru in Hinduism, sometimes identified with Mount Kailash) was believed to be at the centre of the world. Buddha spoke to his followers in the Deer Park of Isipatana (Sarnath) and groves of trees became an important aspect of Buddhist sacred space. The Zen garden is the best-known type of Buddhist garden. But the fame of Zen gardens is out of all proportion to their numerical significance. Zen ideas influenced the Japanese from the 12th century onwards, inspired by Chan Buddhism and Chan gardens in China. The term 'Zen garden' was devised in the 1930s and does not have an agreed or satisfactory definition. Zen ideas are often associated with what Wikipedia calls 'The Japanese rock garden (æž¯å±±æ°´ karesansui) or "dry landscape" garden, often called a zen garden'. A wiser approach would be to associate Zen gardens with Zen design principles. They include the Zen principles of: Austerity, koko; Simplicity, kanso; Naturalness, shizen; Subtlety, yugen; Imperfection and asymmetry, wabi-sabi; Tranquillity, seijaku. The Lotus Sutra was given by the Buddha toward the end of his life. It was recorded as the "SÅ«tra on the White Lotus of the Sublime Dharma." The White Lotus Society has its origins in thirteenth century China. When it was banned, in the period of the Yuan (Mongol) dynasty, it became a secret society. The Buddhist term vihara (literally 'pleasure garden of a monastic precinct') came to denote the monastic dormitory and hall. 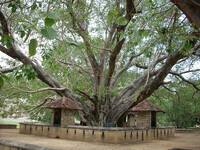 A chaitya is any sacred place (tree, spring, lake etc.). A stupa was originally a burial place but many stupas do not contain relics and the term is now used for any Buddhist shrine with a circular mound form. 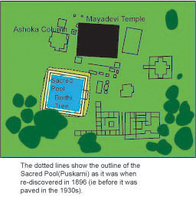 A building containing a stupa is called a 'chaitya hall'. Stupas are frequently placed on hills and the upward journey symbolises the journey to heaven. One of the greatest stupas is at Borobodur (or Barabudur) in Java: 'The stupa is in a long, fertile valley, again on top of a small hill, nestling against a protective backdrop of mountains. The whole field is thus the nave of the chaitya; the hill the stupa's pedestal; and heaven above its arched ceiling. As the mist rises from the foothills of the valley, this enormous monument reveals its volatile silhouhette, light as the rising crest of a wave... Waiting for [the pilgrim] above are the square terraces representing this world, and the circular terraces representing the world of God... Treading the right path to the Mountain of God, he knows that he is heading for the Supreme Truth'. (Nelson I Wu, p 19). Small stupas also use square bases with circular structures above. Though originally an Indian religion, Buddhism almost disappeared from India after the thirteenth century, except in the Himalayan region. The depredations of Turkic, Afghan and Arab invaders contributed to its demise but in many respects it was also absorbed into Hinduism. 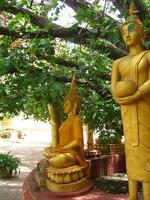 Buddhism flourished in China until 1949 and continues to flourish in many south and east Asian countries, including Sri Lanka, Japan, Burma, Cambodia and Thailand. The Pure Land sect teaches that repeating the Buddha's name, and worshiping him, will make entry to paradise more likely. 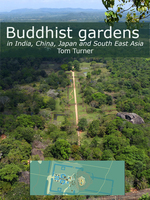 The making of Buddhist gardens in Japan was inspired by Pure Land Buddhism, imported from China. The Mandala, showing Buddha with a temple and a garden inspired the making of gardens with equivalent symbolism. Mandala is a sanskrit word meaning circle, polygon and community. It is used by Buddhists as a symbol of a person in the world, and the universe, as an aid to meditation. The mandala shows a palace with four gates facing the four corners of the earth. A lotus blossom is at the center. It has four petals and rests on a bed of jewels. The gates are guarded by doorkeepers. See for example Joruriji. The Children’s Meditation Garden.Tibetan Peace Garden, London. Peace Pagoda And Peace Temple Gardens, Milton Keynes. 15. 'And, O Ananda, the world called Sukhavati belonging to that Bhagavat Amitabha is prosperous, rich, good to live in, fertile, lovely, and filled with many gods and men. Then, O Ananda, in that world there are neither hells, nor the animals nor the realm of departed spirits, nor bodies of fighting spirits, nor untimely births. And there do not appear in this world such gems as are known in the world Sukhavati.